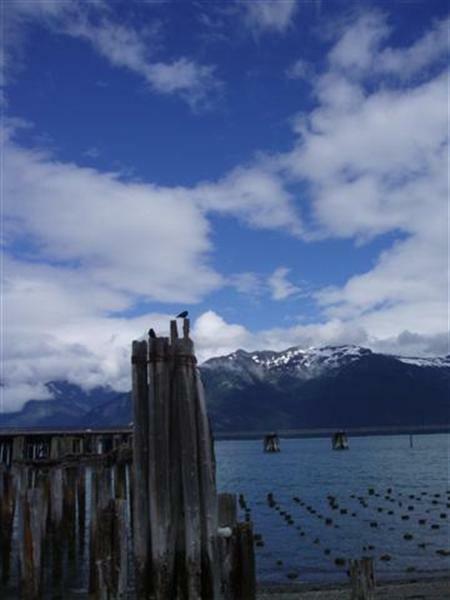 I have been migrating from Los Angeles to Haines, the prettiest little town in Southeast Alaska, for the last 40 years. Like the arctic tern in its epic 25,000- mile round trip journey and the salmon’s primordial yearning to return to the clear waters of its birth, I come home. When snow-frosted peaks of the Coastal Range that hug the tiny berg and Port Seward come into view, I mist over. Alaska is to me austere, rugged and moody, yet thrilling in its unrelenting beauty. Juneau daily in the summer. 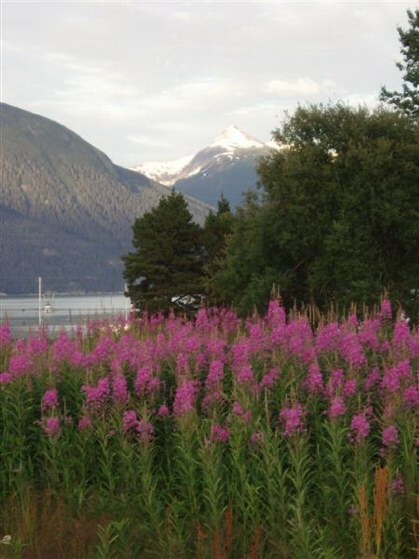 Locals wanting to prevent Haines from becoming overrun with tourists like Skagway, fourteen miles to the north, voted against having cruise ships dominating their landscape more than once a week. Instead, Haines has become a jumping off point for a myriad of outdoor adventures. Nature Tours offers knowledgeable guides carrying high powered birding scopes and leads groups on a choice of hikes. Chilkat Guides raft tourists daily down the Chilkat River where 3,500 eagles congregate each year in the fall. They offer the more daring adventurer a 10-13 day float down the Tatshenshini River, a 140-mile run through 24-million acres of unrivaled grandeur that includes the largest non-polar ice field on earth. Scenic flights over the swirling marble cake patterns of the Davidson and Rainbow Glaciers are available weather permitting. Sockeye Cycle Company rents bicycles to independents and offers 1-11 day tours that take the traveler into the Yukon and British Columbia. Be sure to bring your passport for this and other local outdoor adventures. On my most recent trip home, I took my 89-year-old mother on a safari in a four-wheel drive buggy. We spiraled up a precipitous mountain climb, through alpine meadows to eye-popping vistas of Chilkoot Lake on the freshly carved Takshanuk Mountain Trail. A tasty halibut dinner at a hand-hewn lodge overlooking the Inside Passage was included in the fare. All summer fishermen and women line crystalline Chilkoot River trying their luck for Dolly Varden. Hundreds of tourists turn up at dusk to catch a glimpse of a brownie or black bear fishing for salmon on the far side of the shore. 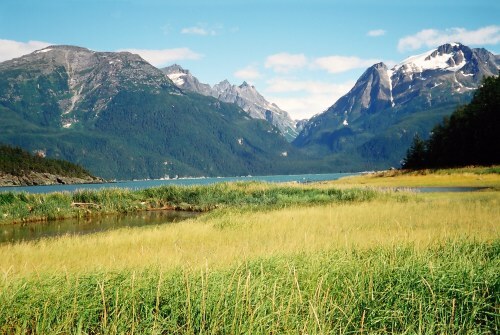 When John Muir ventured here in 1879 he was greeted by Chief Shathitch at the village of Klukwan on the Chilkat River. Muir described him as “one of the proudest and worst old savages of Alaska.” He controlled the trade routes from the sea to the inland tribes and was known to be a shrewd bargainer. 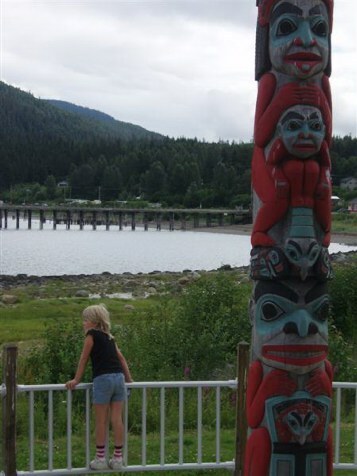 Today Klukwan is the oldest surviving Tlingit village, not a rendering of traditional life for tourists, but a place where Indian people work and live. Inheriting the shrewdness of their ancestors, The Alaskan Native Corporation has made successful investments and has representatives at state and federal levels. The gold rush brought a short-lived influx of opportunists like Jack Dalton. He was quick to take over what was called the “Grease Trail,” so named because the Tlingits used it to carry precious fish oil, used to thicken their blood against long winters, to inland tribes. He, like Chief Shathitch, exploited all those who traveled what became known as the Dalton Trail to Dalton Post where he charged them excessive tolls to pass. Logging and fishing were the economic mainstays in a landscape notorious for its hardships when I lived in Haines. Loggers came into town, lived large for a week and then headed back into the woods for long months of hard work and isolation. Fishermen often garnered $5,000 for a week’s catch. The cannery was the best place in town to find a summer job. Over the years those activities have been curtailed by environmentalists. Almost no logging is allowed in the Tongass National Forest, fishing is strictly regulated, and the long defunct cannery is slated to become a marine museum. As with so many beautiful places, eco-tourism has become the mainstay. 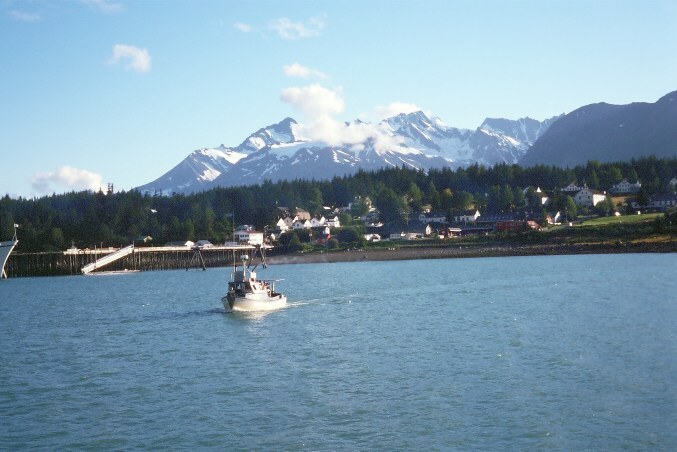 Outside Magazine voted Haines the best place to live if you don’t have to make a living. The population has not increased-rather it has been transfused by an enclave of artists and a burgeoning population of retiring boomers. Local author Heather Lende’s If you lived Here, I’d Know Your Name is the most recent bid to put Haines on the map. A leisurely drive on Mud Bay Road, past the cannery, to the tip of the peninsula takes you to Extreme Dreams. John and Sharon Svenson have thoughtfully framed the Rainbow Glacier in their art gallery window and welcome visitors. If you want to get closer to the scenery, Seduction Trail in Chilkat State Park at the end of the road will take you through the forest and to the shore of the Lynn Canal. Do take your bear spray and don’t hike alone. A walk along the beach through billowing grass and wild beach sweet peas can garner sightings of soaring eagles, an otter curling under the jade green waters or a playful harbor seal -images often depicted in local art. When you get back to town, don’t miss the Sea Wolf Gallery where Tresham Gregg features woodcarvings, silk screen prints and t-shirts with unique spins on traditional Alaskan motifs. For authentic Alaskan crafts, done by native artists, try Bell’s Store owned by my family for forty years. Stop in the Bamboo Room at the Pioneer Bar across the way for a spicy halibut taco and the best clam chowder around. Rambling Roy up the road a piece has an eclectic collection of pioneer memorabilia at modest prices. At Bell’s Seafood, my brother has local catch as well as King Crab from the Bering Sea fresh for local consumption, or he will ship it for you anywhere in the lower forty-eight. Sheldon Museum on Main Street with one of the best collections of Chilkat blankets, famed basketry and photos of the past is well worth a stop. Or you can just sit down at the boat harbor and reflect upon the light dancing on snow-streaked Santa Claus Mountain on the far side of the fjord. It’s a good place to watch fishing boats come in at the end of a long, Alaskan summer day. That’s where I end up when I come home. I’m grateful that in spite of shifts in humanity over the years, the overwhelming beauty of Haines remains the same.